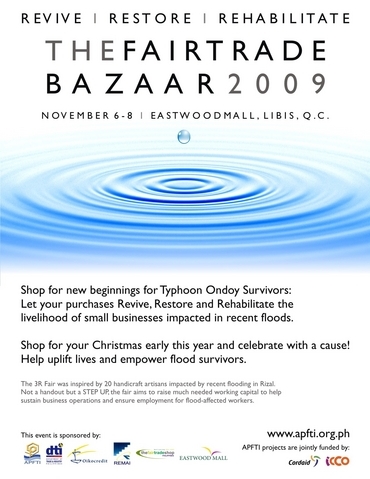 The Advocate of Philippine Fair Trade, Inc. (APFTI), Rizal Exporters and Manufacturers Association, Inc,(REMAI), and The Department of Trade and Industry – Rizal (DTI-Rizal) are pleased to invite you to the event entitled, “The Fair Trade Bazaar 2009” from Friday to Sunday, November 6-8, 2009, Eastwood Mall, Libis Quezon City. 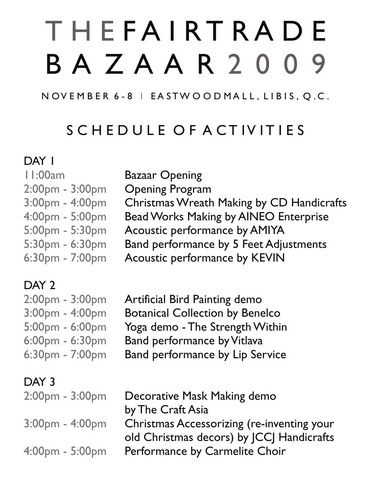 The 3-day trade bazaar will feature fashion accessories, bags, Christmas decors, home decors, and a whole lot more of REMAI members' products. This will be a selling activity to help them accelerate the rehabilitation, revival and restoration of their livelihood. Come and visit us, let your purchase rehabilitate, revive and restore the livelihood of small businesses imapacted in recent floods. They are not asking for doleouts. They are asking you to check out their wares in case you want to shop anyway, and end up helping them bounce back from where they have fallen.